May be easily replaced by Alpha 20, ships in 1 Day. $169.00. 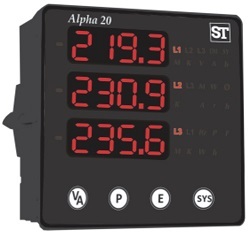 A compact rugged package digital meter that offers basic power and energy measurement and Demand measurement capabilities required to monitor electrical installations. 3 Phase, Aux. 40-300Vac/dc, Input 500V L/L 1/5Amp RS485, Limit Switch. P/O Relay.